Artwork: Cover art and interior illustrations by Charles Keegan. Cover design by Carol Russo Design. Maps by Ellisa Mitchell. Interior ornament art by Matthew C. Nielson and Ellisa Mitchell. 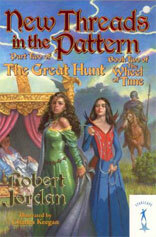 Released by Starscape Books (an imprint of Tor Books), New Threads in the Pattern is the second half of The Great Hunt in oversized paperback format (the first book is The Hunt Begins). The books are intended for younger readers, although the text has not been altered.